Practicing an “abundance mindset” or “prosperity consciousness” (or simply a positive outlook if you don’t happen to be into personal growth lingo), is very important to the success of your business. You’ve no doubt experienced this. When things are going well, you feel unstoppable, on top of the world, insert your favorite cliché here, and you’re more motivated than ever to do the next big thing on your business to-do list, the thing that will get you closer to your dream scenario, even if it feels huge and uncomfortable and scary. You’ve probably noticed that when you feel positive about your business and act from that state of consciousness, more good things come your way. But when things aren’t going so well – your last promotion launched to crickets, you made very few sales last month and your income ain’t looking too damn skippy this month either, no one is reading your blog posts or opening your emails, and you don’t have enough clients, no matter how much marketing you do – well, then, it can be a tad harder to feel motivated to keep at it. Me, you, and everyone else we know who has a successful business doing big things in the world has experienced the above not-so-wonderful scenario. The trick is to not let yourself spiral into a negativity funk that becomes your permanent state of mind and prevents you from making progress on your business goals and big vision. Back in August, I went through a couple of very trying weeks. It’s wasn’t any one big thing, but a long series of minor annoyances, stressors, irritations and challenges, that piled one on top of the other in rapid succession, left me feeling overwhelmed, cranky, and defeated. And it just kept coming. From a slow business month to a minor car accident to a call-back after a routine medical test (turned out ‘twas nothing) to a few other unsavory things, and I was hitting the Ben & Jerry’s Vanilla Caramel Fudge like nobody’s business. Practically nightly. Now, I’m generally a very positive person, but during those two weeks in August, I’m sorry to say I spent a little bit too much time dwelling on what I did not have. In my business, I wished for more income, more clients, a bigger email list, a new website, and a best-selling book. In my personal life, I wanted more time to visit friends, time to write for myself, a lavish vacation off the grid for a couple of weeks, and a few other things I’d be too embarrassed to share in a public venue. I felt hamstrung and stuck by what I perceived to be my “lack” of this or that thing. But the “lack” is a big fat lie. It’s a myth. The truth is, I have everything I need, right now in this moment, to create exactly the business and the life I want, while enjoying the really wonderful life I already have. When I succumb to that nasty lack mentality in my business, what pulls me out of it every time is focusing on the benefits, resources, opportunities and advantages I do have, by making an asset list. Once I made my own asset list, which includes everything on the list above and more, I felt much, much better about those two terrible weeks in August, which in truth, weren’t that terrible after all. In fact, because things were a little slow business-wise in August, I was able to go home to visit the family for a few days, focus a big chunk of time researching and outlining my book, and map out my 4Q plan, all things that wouldn’t have happened had I been booked solid with work. And, since it’s a law of the universe that what you focus on expands, when I paid attention to the assets in my business, rather than the so-called lack, new opportunities came my way. I got six new clients, an uptick in email subscribers, an introduction to what could be a huge source of referrals for my business, and a few other pretty great opportunities that will play out over the next few months. 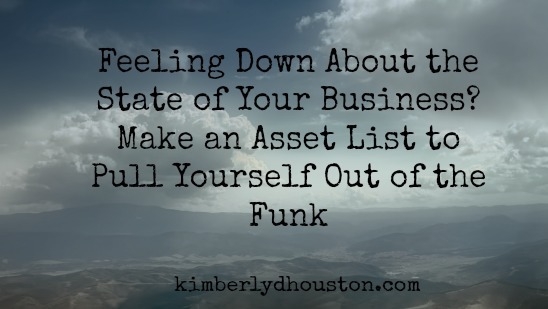 So if you’re feeling down about the state of your business, bemoaning all the things you think you lack, sit down and make your asset list. You’ll feel a whole lot better when you do. And when you focus on all the good you already have, more good will come to you.